Welcome to the May, We’re All Ears blog hop! Once a month, Erin Prais-Hintz posts a picture on the Earrings Everyday blog to inspire our earring designs. Then we all share what we have created. This month’s inspiration is a beautiful photo of Zigzag Nerite Shells. Isn’t nature amazing? 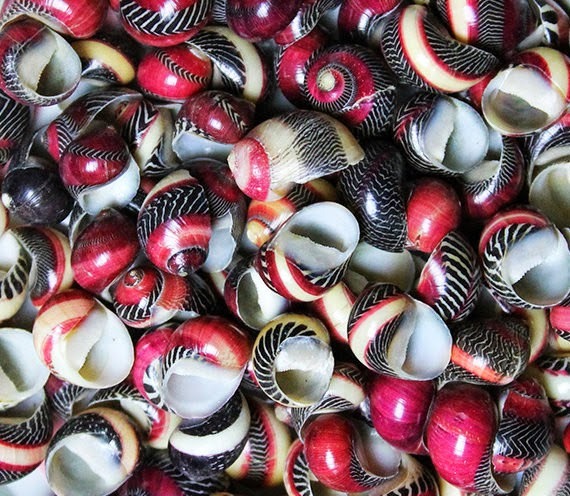 I love the deep, rich red in these shells and wanted to be sure that was a dominant part of my design. Next I dug through my black bead stash, but somehow none of those beads seemed “just right”. They all just looked sort of ho-hum with the red beads I’d selected. My next thought was to pair the red beads up with some copper, at which point I spotted these cool artisan spirals that I’d purchased quite some time ago. The copper spirals were a perfect way to echo the spiral form of the snail shells! Now that I’d found a “theme”, the rest was easy. I made spiral headpins out of patina’ed copper wire and bent the spirals upward so they made a spiral at the center of the red beads. I made a triple wrapped loop at the tops of the beads and attached them to the copper spirals. The Spiral Nerite Earrings will be in my Etsy shop later this evening. UPDATE: The Spiral Nerite Earrings are now in my shop HERE. Now comes the fun part. Click on the little frog picture at the end of this post to get links to all the challenge participants or simply go to Earrings Everyday for all the links. Then visit everyone’s blogs to see the wonderful earrings they have created! This entry was posted in Bead And Jewelry Challenges and tagged blog hop, earrings, handmade jewelry, Linda Landig Jewelry, nerite shells, red earrings, spirals by Linda Landig. Bookmark the permalink. Thank you Jean. Once I located those spirals, I knew I was “on track”. These are so cool Linda!! I love the spiral wire and how you attached the bead! Wonderful!! Love your earrings and especially how you connected the bead! Will have to try something similar. Thanks for the inspiration. What a great way to use these beads, I love the earrings in that deep red shade with the copper. I love those beautiful deep red beads, and the copper spirals are so unique. The addition of the spiraled headpin pulled your theme together so nicely. Fun earrings! Love the use of the copper spirals and the way you manipulated the wire to add your own spiral to the design as well. Great comment on the spiral theme in these gorgeous Nerite shells! Love those double balled head pins. They create such a professional look to these earrings. I love what you did with these, Linda. Repeating the spiral them found in nature really works here! Beautiful design! Love the copper balled wire spiral — very creative. The beads are beautiful as well. Way to incorporate the spiral…terrific! 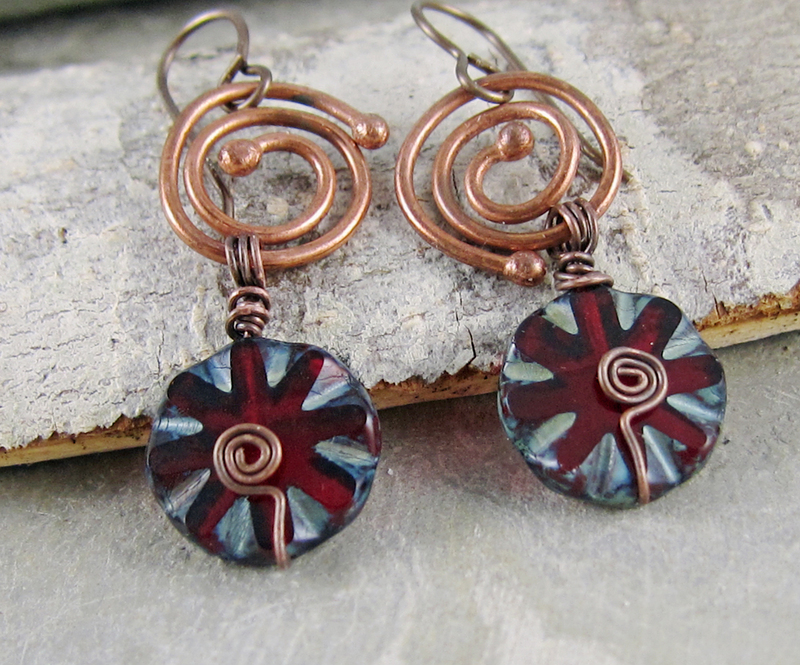 Your spiral copper elements are nifty! And the way you attached the discs adds another nice effect–very evocative of the nerite shells! Nice! I really like what you did with your spiral headpins. Love your design!! I feel like I am at the beach! It is great to hear how it all came together. Love them! 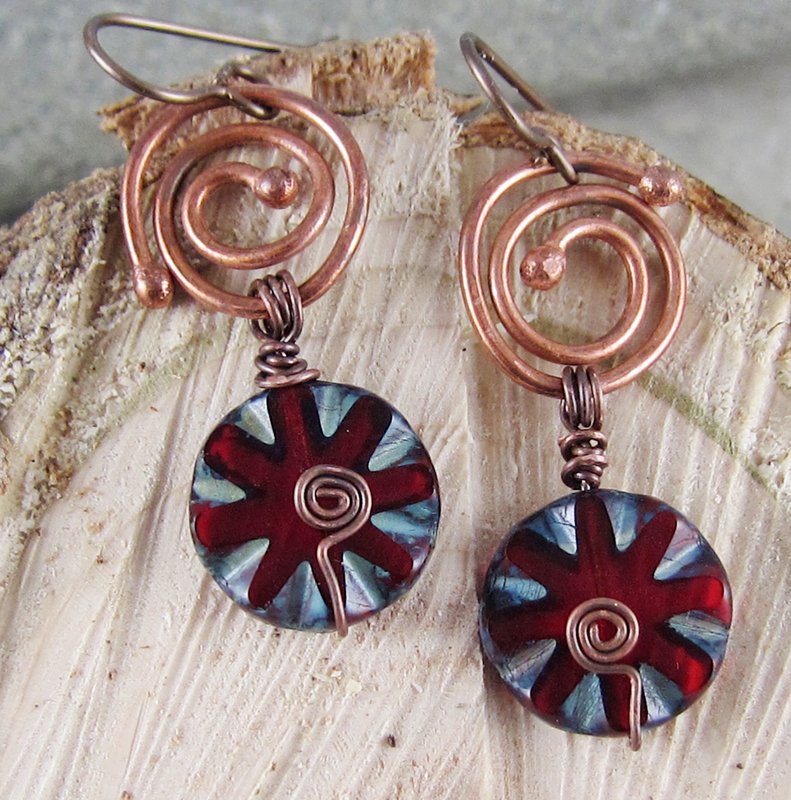 All the ways you incorporated spirals and the wonderful red beads you chose, perfect!